The most fun I ever had in high school was when I played the clarinet in the pit orchestra for a couple of musicals. Even then I loved musicals, and to sit in the pit for every dress rehearsal and performance, and to be a part of it, was something kind of magical for me. And even though I didn't end up making a career of it, I consider my involvement in the arts (which also included concert band, marching band, and various other band-related activities) to be an invaluable part of my education that helped to make me a well-rounded person. 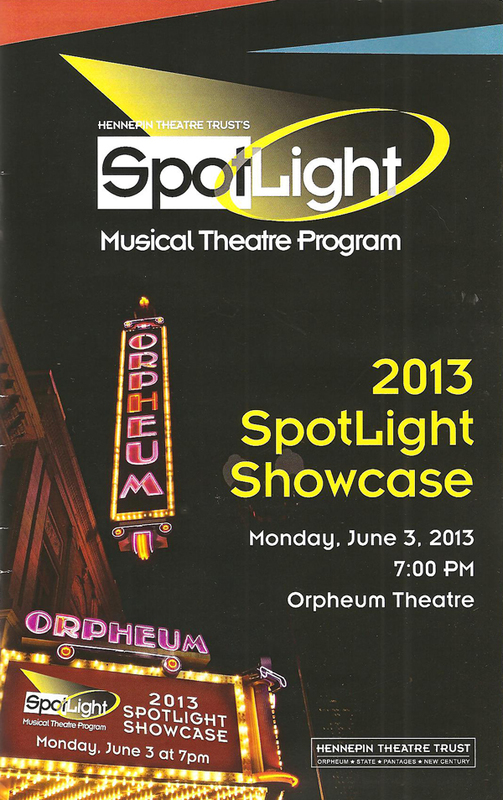 Hennepin Theatre Trust's Spotlight Musical Theatre Program sponsors such involvement in the arts, specifically musical theater, through various programs throughout the year culminating in the Spotlight Showcase. I attended the 8th such Showcase last night and was quite impressed by the talent of the young people of Minnesota. It was a little like attending a show choir competition on Glee, but this wasn't so much as a competition as a celebration of achievement. Over a dozen high schools performed selections from a show that they did this year, as well as group numbers by individuals deemed "outstanding." With very funny emcee Greta Grosch, music director extraordinaire Denise Prosek, and choreographer Julianne Mundale (a fantastic Chanhassen dancer), the kids got to work with some top professional talent. In a town with such a strong professional theater community, it's great to see them giving back and fostering Minnesota's own young talent. Apparently the high school musical theater canon hasn't changed too much in twenty years; both of the shows that I participated in were represented at the Showcase - The Sound of Music (by Wayzata High School, with a stirring rendition of "Climb Every Moment," a song that never fails to give me chills) and Anything Goes (by White Bear Lake High School, with a fantastic tap number). Along with other classics such as Guys and Dolls and Hello, Dolly!, it was nice to see some of the newer musicals represented too, like 25th Annual Putnam County Spelling Bee (Moorhead High School's performance was my favorite of the night, perhaps because a middle school spelling bee is an appropriate subject for kids, and also because these kids seemed to be having a great time playing the quirky kids of the Bee), Urinetown (performed by Maple Grove High School and Washburn High School, a fun preview of the show opening at the Jungle this weekend), and Aida (Minnetonka High School's performance of "The Gods Love Nubia" to end Act I was the showstopping moment of the night). The "outstanding" orchestra members also got to perform, although both selections were non-musical theater songs (a medley from the Queen jukebox musical We Will Rock You, coming to the Orpheum this fall, and "Thank You for the Music" from the Abba jukebox musical Mama Mia). 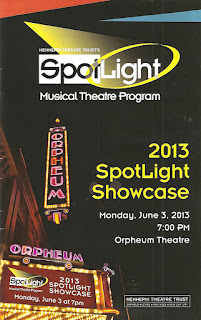 If only Spotlight had existed when I was in high school, how I would have loved to perform on the Orpheum stage! Finally, the twelve "Triple Threat Award" finalists performed a medley of musical theater songs, and somehow the evaluators chose two of these talented kids to win a theater trip to NYC. This was my first time attending the Showcase, and I really enjoyed seeing the amazing talent that exists in Minnesota's young people. I hope to see some of them on professional stages in the future! Although the show was too long and a bit draggy in parts (as high school awards events usually are), I recognize that it's important to give as many kids as possible the chance to shine on the big stage. And boy did they! For more information on the Spotlight Musical Theatre Program and how to get your school involved, check out their website.